Bethany Crumpton took victory by the narrowest of margins in a dramatic sprint finish in round five of the HSBC UK | National Cyclo-Cross Trophy at Ipswich. The overall women’s leader, who is bidding to retain the title she won last season, beat former team-mate and domestic rival Anna Kay (Experza-Footlogix) by half a wheel. Meanwhile, Braam Merlier (Creafin-Tuv Sud), who like Crumpton also won at the opening round in Derby, returned to the UK in search of more UCI category points. The Belgian rider powered clear of his rivals midway through the race and built up an unassailable margin. 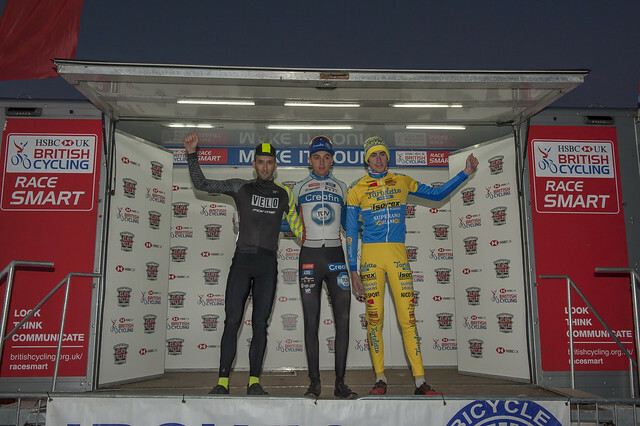 Ian Field (Neon-Velo Cycling Team) regained the men’s series lead from team-mate Yorben Van Tichelt with a second-place finish, going into the final round in Shrewsbury after Christmas. Senior National Trophy series leader Crumpton and Under-23 series leader Kay were only separated by half a wheel after matching each other throughout an exhilarating race in Suffolk. How does it feel to win a @HSBC_UK | National Cyclo-Cross Trophy event? The two-way tactical battle for victory started after the opening half-a-lap and the pair were always set to battle out the victory. Behind, junior rider Josie Nelson (RST/Cycle Division Racing Team) had a lone chase in third as the gap gradually grew to the leaders. Junior series leader Katie Scott (Hargroves-Montezuma’s) was in a group of four riders chasing, with fellow junior Alderney Baker (Team Empella Cyclo-Cross.com) and Under-23 rider Sophie Thackray (PH-MAS/Paul Milnes Cycles), along with seniors Charlotte Haywood-Mahe (Les Filles Racing Team) and Annabel Simpson (Hope Factory Racing). Crumpton threw everything at her rival on the final lap, forcing the pace on the muddy mounds but couldn’t force a gap. Coming into the long road finish section Crumpton led, with Kay coming up to her side as they approached the line, but the older rider just edged the victory. Belgium rider Merlier returned to the National Trophy to take another victory with a powerful display in the men's event. He was part of an early leading group which included Field and fellow Belgium under-23 rider Arne Vrachten (Tarateletto-Isorex) and went clear after the second lap. Behind, then National Trophy leader Yorben Van Tichelt (Neon-Velo Cycling Team) had a slower start but worked his way through to be the lone chaser of the leading trio. Under-23 rider Toby Barnes (Lichfield City CC) and Isaac Mundy (Madison Genesis) were also stuck in a battle for fifth after being gapped by a Merlier serge on the second lap. Merlier made his winning move with over half of the race remaining and pulled out a slender gap with Vrachten originally leading the chase before a slip with four laps to go allowed Field to respond and Merlier to pull well clear. The following lap Field made his bid for the second podium spot and attacked his younger rival to pull out a slender gap with two laps to go while Merlier had a lead of 25 seconds. Merlier had time to celebrate his victory and had a ceremonious final lap while Field held on for second to regain the overall leader’s jersey from team-mate Van Tichelt. After winning her race, Crumpton commented: “It was really cool to have a sprint finish there and it’s very rare you get that in cross. “It’s good to practice those sprints for future races and it was a really enjoyable race and really technical so I enjoyed it with lots of twists and turns. After his win, Merlier said: “At the beginning the feeling wasn’t so good but I took the front and opened a little gap. The sixth and final round of the HSBC UK | National Cyclo-Cross Trophy takes place after Christmas and sees the riders head to Shrewsbury in the Midlands.